The Volkswagen Beetle is one of the more recognizable models you can drive. Now, it’s back for the last time in the 2019 Beetle here in Ventura, CA. However, it certainly isn’t going out without a certain amount of pizzazz. Let’s see what this model can give to your drive. This model has a 2.0L TSI engine that powers your drive with 174 horsepower and 184 lb.-ft. of torque. It has an EPA-estimated fuel economy of 26 miles per hour in the city and 33 mpg on the highway, so it’s a solid option if you have a longer commute or if your daily route involves a lot of stoplights. You can express a bit of your personality with the color of your vehicle. You’ll have 9 different colors to choose, from the fiery Habanero Orange Metallic to the adventurous Safari Uni, which is a color you can only get on this Final Edition of the 2019 Beetle. Let's check out other perks that come from driving this quirky Volkswagen model! Technology includes the connectivity of Bluetooth®, Android Auto® and Apple CarPlay®. Listen to your favorite playlists with the Fender® Premium Audio System, which gives you 400 watts and a clear sound. You can also see some useful driver-assist features like the Rear Traffic Alert, Park Distance Control, and Blind Spot Monitor. You can also have a push-button start system to make things even easier in the VW Beetle. Depending on which trim you get, you can potentially find yourself with a panoramic sunroof. Of course, if you are looking for no roof at all you should take a look at the convertible version of this model! 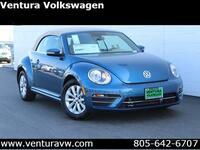 Don’t forget to test drive the VW Beetle today here in Ventura, CA. Our team at Ventura VW would love to show you all the perks and quirks of this vehicle. You can contact us if you have any questions or if you would like to schedule an appointment.